Sometimes you plan it, other times you don't. Either way, you still have the task of writing that character's death--and it needs to be good. What's the point of going through all that work and emotional trauma of killing your baby if you give him or her a crappy death scene? The truth is, if you don't care about the character's death, the reader won't care, either. And that simply won't do. I have planned a lot of character deaths, and not all of them fall through. In fact, a character I practically created for the purpose of dying in my first book decided at the last minute that she wasn't dying. Then the direction of my book changed and now things are different, thankfully in a good way. So. It was around 10 PM. I was in my room, enjoying a typical night with my laptop, texting my cousin/writing buddy when all of a sudden I got the biggest urge to write the death scene for a character of mine. I knew this character wouldn't die until the final book in the series (which I was nowhere close to writing) so of course, I had to write that scene. I just had to. And oh my gosh did I write it. I cried. Very hard. For a long time. Then I sent it to my cousin (the same one I was texting as I was writing the scene) and asked her to read it. Five minutes later she texted me saying she was now sobbing into a pillow and she hated me for killing that character. 1. You have to cry. I practically live by this now. You want the scene to make your reader cry? Well then you need to write it so it's enough to make you cry. 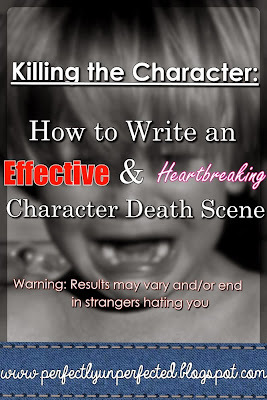 Killing a character is a difficult task, especially if that character is one you love. So if you pour your own emotion into the scene, odds are the reader will feel it, too. If you don't cry when you kill the character, then the scene isn't sad enough. Rewrite it until it makes you cry. 2. Listen to sad music. Either sad music, or rain. When I write death scenes I tend to listen to slow and sad instrumentals, like Rue's death song from the Hunger Games or Terrible Things by Mayday Parade (my favorite band everrr.) My absolute favorite, though, is the instrumental version of Say Something by A Great Big World. This song already makes me want to cry on it's own, so when I wrote the death scene I mentioned before to this song, it really set the mood and let me make the scene feel real. 3. Don't force yourself. You want the scene to make the reader feel like they've personally lost a friend, and if you just aren't having a good writing day or your motivation is low, stop. Death scenes are important scenes, and should be written when the time is right. Sometimes I feel like writing fun, happy scenes where my characters are smiling and life is good. Other times I feel like writing dark and depressing scenes like torture or death. Make sure that the mood you're in is right for what you want to write, and if the words don't come, don't force yourself. You'll be able to write the scene eventually. For most genres, character deaths are not only inevitable, but sometimes, they're necessary. Whether it's to move the plot forward or add a shock factor, killing a character off needs to be done in a way that affects the reader as well as the writer. This is the same for practically any emotion, as well--anger, jealousy, embarrassment, etc. Whatever you want the reader to feel, you need to feel as well. Because if what you write doesn't affect you, odds are it won't affect anybody. **UPDATE** I am absolutely floored by how popular this post has become! It is by far the most popular post I have to date. Thank you to all of you lovely readers for taking the time to check out my little blog. It means so much! Nice! Now I can write a good dramatic death scene for my book. Thank you sooooooooo much!!!!!!! I recently lost a friend of forty years. I came back from the final arrangements sad almost depressed. I wrote my death scene immediately, projecting my emotions of my loss. I will do developmental editing when I reach this scene. Thanks for your article. These songs are awesome for death scenes. I've made it a personal rule that if I don't cry, the death scene is rewritten. Like you said, death scenes are so so important. Haha! A couple of weeks ago I decided to try to write my character death scene. I wasn't to that part in the novel yet but it was raining and I was feeling very sad because I had just found out a friend of mine died. It didn't actually come out that well though so I'm off to try again; thanks for the great tips!! Good tips. Though what do you do when you're not someone who generally cries? ;) I try to make myself sad when I write, and it doesn't usually work. Sometimes I can make myself sad though... and actually, I think I almost cried when I wrote the death scene for one of my villains. go to youtube type in: Rachel Hardy see you again. p.s love how you did the Bible verse. I don't see that on the internet enough anymore. Hey Paige! In this case, I think it's okay that the scene doesn't make you cry since you're writing it before anything else. I suggest writing it the way you want to write it (whether it makes you cry or not) and then move on to the different parts of your book. Once you have more of a connection with your character, come back to the death scene and edit it. You may find yourself feeling like crying now that that connection is there. Good luck! Case in point: in two or three of my works I've written death scenes and yes, I cried while writing them. In fact, I cry every time I re-read them. This comes after having written the scene(s), knowing what's coming, and yet the tears show up. I agree wholeheartedly that the writer needs to be 'in the mood' to create such magic. 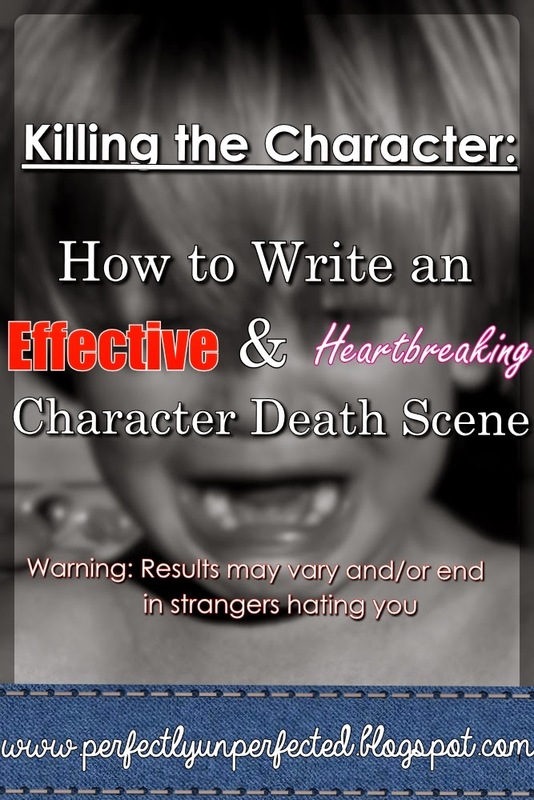 Hi, so I read this and thought that it was very, very helpful(especially because I'm killing my main character(Yeah i know)) and I have one question. I don't cry while watching movie or tv or while reading. The only times I have are during the Outsiders(JOHNNNNYYYYYYYY) and the Lion King(MUFASSSAAA). DO you have any advice on how to write something realllllllllllllllllllllllyyyyyyyyyyyyyyyyyyyyyyyyyyyyyyyy sad so that even the non cries sry? Awesome point! Thanks for the tips! Your song suggestions are my favorites as well. Do you have any others? Okay, I'm convinced. I'm back from you tube and my eyes are still wet from tears. Having lost several brothers over three decades, two children and with my dad struggling to hang on at a very old age, it doesn't take much to make me cry these days and that song gripped my emotons and sqeazed the tears until I'm almost dehydrated. I needed a good cry. Thank you. I'm suddenly in the mood to write a sad death scene and I hadn't planned on writing one because I didn't think I could handle it with my dad in the hospital. But, I realize that this is the perfect time to write a scene I have been putting off. As writers, we need to use every arsenal we have available in our tool chest. I found your blog while thumbing through Pinterest to pass the time at the hospital and I'm so glad I did. Your article is extremely informative. Thanks. You have a new follower. Hi Melissa! I am so sorry for everything that you've been through/are currently going through. I'm glad I could help, though! Best of luck with all your writing endeavors, and thanks for the follow! I'm almost to the point where I'll have to write a beloved character's death, and I come near to tears just thinking about it... I kind of go numb. When the doomed character has unfinished business, or a long-lost friend they were just starting to reconnect with, that makes me cry. Mostly though, I cry over a wasted life, like when the villain only redeems herself through sacrificing her life. I love that your favorite band is Mayday Parade! They're amazing and I don't meet many people who feel the same!! This was great advice thank you!! I love your tips! Recently I came up with a 1916 rising story that involves a very important character death, and I have never killed a character before, believe it or not! This will be my first time, and I'm a bit scared. I don't think I can make myself cry- I'm a robot when it comes to fictional people. I didn't cry at the Reichenbach Fall in Sherlock, nor did I cry in Doctor Who when Amy and Rory left, nor during Doomsday... you get the idea. What can I do? THX for this! I'm writing my very first, extremely rough draft, and I coming upon a very major death. This was very helpful! Thank you SO MUCH!!! This is great advice! I write stories in my free time, and death scenes are some of my favorite parts. (MAYDAY PARADE IS THE BESSSTTT) I don't think you can see my name on here but it's Natalia Bakker and you have yet another follower! Thanks for the great tips! Thanks, Miranda, this is a great post. I'm working on a multi-generational family saga that spans roughly 400 years---so, there will be MANY, MANY, MANY deaths to cover. Some due to age/illness, others due to war/conflicts---and others that are random twists of fate (e.g. accidents etc) just a lot of Grim Reaper time. It can be very hard to kill off someone who has become a dear friend. I too like to listen to epic soundtracks while writing. For death scenes, I like 'The Hunger Games' 'Braveheart' and 'Gladiator' oh, man, those bagpipes in Braveheart--it makes you want to keen and weep until you retch up a lung. Gladiator is good too--I like the battle music and the more reflective tracks. Thank you again for these tips to ponder--it should make my next 40 or 50 novels a bit easier to write. Thanks for sharing this to us ;3 I suddenly need to write my characters death scene, like, right now. So once I'm done here I will go and kill one character >:) I feel so evil xD Once again, thank you for this ;3 Greetings!! I never EVER cried for a book. How am I supposed to make myself cry?! This is amazing. I have read and re- read this post so many times. One song that makes me cry every time is 'Til my Heart Stops by Too Far Moon. I don't cry a ton, but I cry enough and this song is THE SADDEST SONG I'VE EVER HEARD believe me when I say that. I wrote my death scene about 3 months before I found your post, but I have applied all the criteria you mention - and I passed! Even when I re-read the scene now on one of my many, many, many edits it still makes me cry (and I'm a man!!!). Like you, I wrote the scene when it came to me, then built everything else round it. I think it's pretty good because I've only changed the odd word here and there in edits and it just holds together really well. If the rest of the book was as good, I could have a winner. Keep up the good work. I'll keep an eye open for your posts in future. This is great advice. I've been considering killing my favorite character, but every time I even consider it I feel like an awful person and start crying. Is it worth killing this character if it'll possibly ruin my main character's life? If you are questioning this scene's significance to the story, maybe it isn't really necessary. However, if you want to press on with it anyway, I think killing this character might be a really great place for your main character to grow! Maybe you could try this instead; this particular character could almost die, giving your protagonist an opportunity to realize how much this person means to them. Those types of scenes can be just as heartbreaking as a death scene itself. Hi. So i am currently typing a murder story...(i know i was shocked by my own decision when i had to choose) I don't necessarily need the readers to cry(though i kinda want them too) but i know that will be hard since I need to get the death scene over with so i can focus on the main part of the story. What do you suggest I do to grab the raw sadness of how my protagonist is feeling and transfer it to the readers? Hi! My biggest suggestion would be to not rush through the death scene. Even though it's not the most important part of the story, it's still an important part of your character's development. Try to imagine yourself in the situation that your character is in and avoid telling information. Instead, show it! Use the five senses. Instead of saying that your character sees blood on the floor, make them gag or cringe at the metallic scent. Stuff like that :) Hope that helps! Hi there! I have a bit of a delimma... One of my characters will be introduced for the first time during their death scene, the sole puepose of this being so she can reveal a secret only she knows. One of my protagonists (yes, I have three in this story) must be strongly affected by this death. However, I continually come up short with the sadness factor of this story. Any advice? Hi! I'm learning to become a writer, and yesterday I found the link to your post on pinterest. I find this post very interesting and helpful, and I totally love it! But I want to ask you for a permission: Can you let me translate this post into Vietnamese? In Vietnam we don't have these kind of article, so the teenagers like me who are interested in writing don't have much guidance to improve our skills, and many of them are not very good at english to read the helpful foreign posts. So I want to help them by translating your post, of course if you allow me to do that. I promise I will write clearly the original link of the post in my translation, as well as your name - the owner of the post. I typically just write for myself and it's mainly all fanfiction and my main character is typically the same person. Some times though I just get this really strong feeling that she needs to die even though it won't help the story. I'm one of those people who doesn't cry easily. Another problem is my character is young, not ever really older than 17 and healthy, but she's fighting in a war. I want her death to be painful, longish, and for her to be surrounded by friends and family or maybe alone. Maybe it starts out alone and then they come in. But I don't know how to write it. Help?